Deciduous trees are ones that lose their leaves in the fall. Examples include oaks (Quercus spp. ), hickories (Carya spp. ), maples (Acer spp. ), and sourwood (Oxydendrum arboreum) trees. Their autumn color display is long gone and the trees have entered their dormant period for the winter. Now is the time to consider pruning. Proper tree pruning can add form and structure. Removing dead and damaged limbs leads to healthier trees and reduces the risk of insect attacks and infection with diseases. Sharp hand pruners to remove smaller twigs and branches less than 1 inch in diameter. Heavier pruners commonly called “loppers” for branches 1 to 3 inches in diameter. Hand saw for branches and limbs 3 to 5 inches in diameter. Pole saw—which will extend to about 10 feet—if you need to remove branches up to that height. Using ladders when trimming requires extreme caution! Do so only when you have someone who is able to steady the ladder for you while you climb. 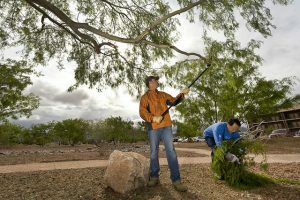 Limbs and branches greater than 5 inches in diameter and any pruning more than 10 feet off the ground require the use of gasoline-powered chain saws and specialized climbing equipment. Unless you are trained and certified in the use of such equipment, hire a certified arborist or tree company that is fully insured! 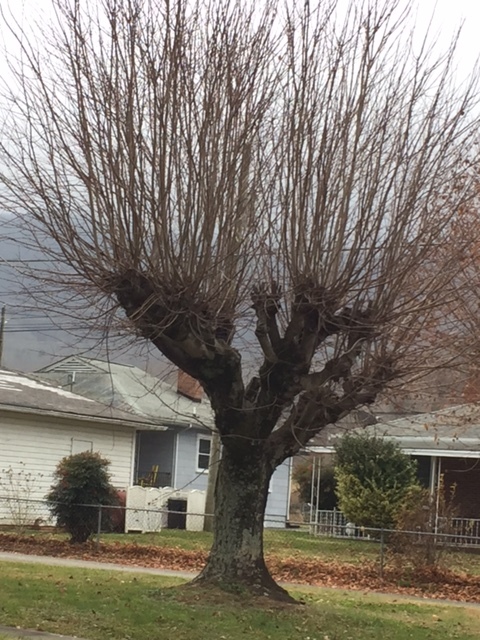 Once you remove a limb or branch you cannot put it back, so use caution when approaching any pruning decision! Take time to walk around the entire tree and envision what it will look like when you complete the work. First consider removing branches growing directly toward the house or that impede your ability to walk under the tree. Once these are removed, take a step back and evaluate how to proceed. Next to go are dead branches and limbs that are rubbing against other limbs. 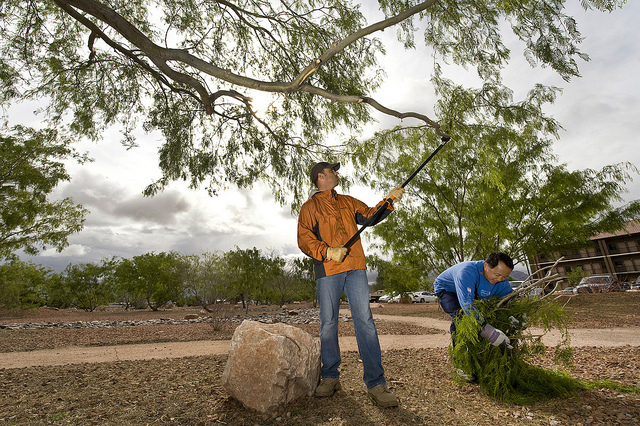 Pruning small branches: When pruning small branches, always cut back to a vigorously growing branch or bud that points in the direction you want the branch to grow. Cut about 1/4 inch above the branch or bud to avoid leaving a perceptible stub. This will minimize any damage to the branch collar that might occur if you cut any closer. Correctly pruned tree leaves limb collar intact. 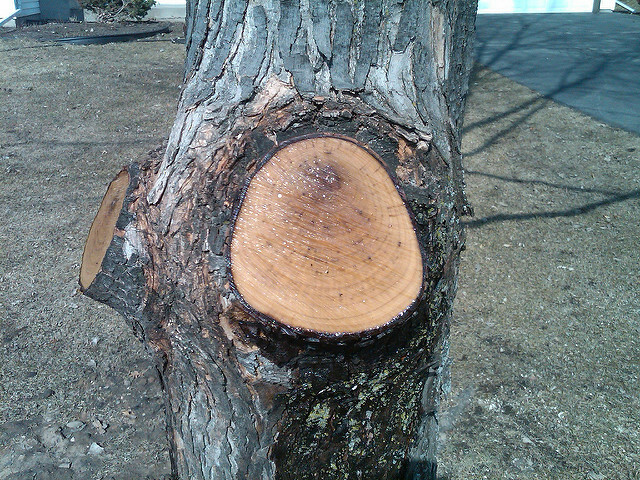 Make the first cut away from the trunk to avoid “stripping” the bark. Start about 6 inches from the trunk and begin to cut up from the bottom of the branch, stopping when you’re a third of the way through the branch. Make your second cut from the top of the branch, in line with the bottom cut so the limb will fall from the tree. Your final cut will remove the stub that remains. This cut should be made flush with the “limb collar” at the base of the branch, not flush with the trunk. Tree topping: Never “top” your trees! 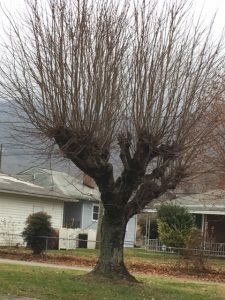 Although this technique is often seen in the landscape, it is the surest way to have your trees decline in vigor and health. Topped trees develop multiple secondary branches that are problematic aesthetically and weaken the trees’ structural integrity. No responsible arborist or tree company will recommend topping trees. Wound dressings: Do NOT dress tree wounds under any circumstances! Researchers have shown that commercial products for tree wounds—paint, tar, varnish, or other such materials—trap moisture and increase disease problems.